America’s Independence Day often stirs up images of picnics, parades, fireworks and hot summer days. While a few of these aren’t exactly synonymous with Alaska (the midnight sun can sometimes make viewing fireworks logistically tricky), Alaskans have a special flair for unique Fourth of July celebrations. Below are a few of these annual spectacles showcasing some of the most scenic, strange and downright fun offerings in the Last Frontier this holiday weekend. The Mount Marathon race in Seward, Alaska, is one of the most extreme races in the state. Now in its 87th year, this Fourth of July event is widely regarded as one of the best spectator events of the summer, where both locals and visitors flock for the holiday weekend. Traffic can be heavy, but so is the fun factor. The race begins as thousands of spectators watch some of the best athletes in the state and beyond run up 3,022 feet of Mount Marathon’s unforgiving terrain, clambering over rocks, roots and waterfalls before hitting the turnaround point back down the mountain to the finish line. The race is followed by a celebratory parade, street fair and even a fireworks show at 12:01 a.m., officially kicking off the holiday weekend in Seward. Girdwood, Alaska, is a laid-back mountain town nestled at the base of the 2,300-foot Mount Alyeska, one of Alaska’s most popular destinations for skiing and snowboarding. In summer months it’s a mecca for hikers, mountain bikers, mountain climbers and festivalgoers, especially during the annual Forest Fair over Fourth of July weekend. One of the most popular Girdwood events of the summer, the Forest Fair consists of three days of music, dancing, locally made crafts and food, and even a parade in true Independence Day fashion. It’s the perfect event to get in touch with your naturalist side and dance the night away! Perhaps one of the more unexpected summer celebrations is a Fourth of July extravaganza in Santa Claus’s stomping grounds. The community of North Pole, Alaska, about 15 minutes outside of Fairbanks, hosts the Fourth of July Summerfest with a kickoff community parade in the morning, followed by a children’s bike-decorating contest. When the dust settles, there’s a community fair near the Santa Claus House with numerous vendors and booths to keep the celebration going. Later on, explore North Pole and check out the Christmas decorations the town keeps up all year long. On July 5, the town gathers for the Jingle in July Jingle Bell 5K Run. Whether it’s celebrating Christmas in July, observing incredible feats of endurance or channeling your inner flower child, we guarantee an unforgettable holiday weekend in Alaska. 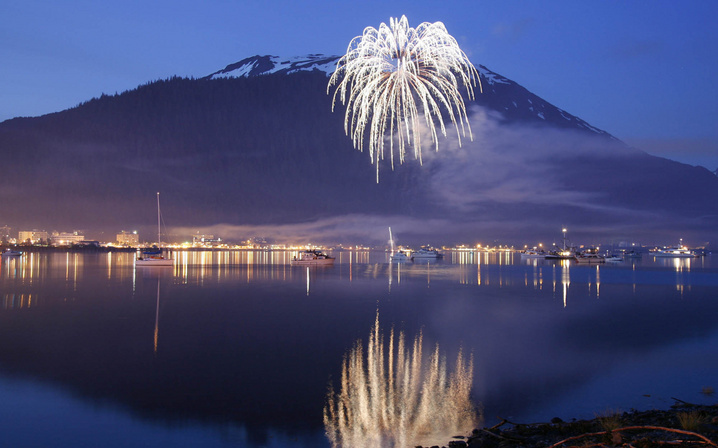 Happy Fourth from all of us at Princess Alaska Lodges!